Here are the designs from last weeks inspiration - shabby chic baby shower invitations. 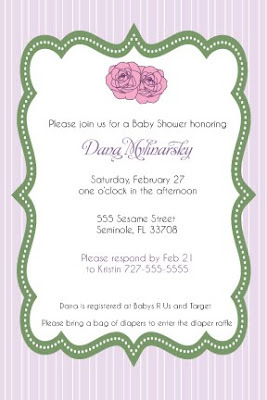 The Mom-to-Be, Dana, ended up picking the invitation below. Below are the two other invitations she had to choose from. Each client always gets to choose from three different designs and can make as many tweeks as needed. This ensures the invitation is truly perfect for the client and fully captures the theme or vibe of the party. I had such a great time designing these for Dana. I know her shower is going to be beautiful.